Follow Friday is a meme hosted by Rachel at www.parajunkee.com. This is my first time participating. What is the worst book you've ever read and actually finished? My question is... why would I finish it if I hated the book? I could force myself but that wouldn't be very much fun, now would it? So this question then makes me think of books I had to read for school - Yalo & Little Mountain by Elias Khoury, Beloved by Toni Morrison, The Heart of Darkness by Joseph Conrad.... lots and lots of books that are considered classics but that I really didn't like. I'm not sure if some of you would have read those novels so I'll adapt the question. What's a book that you've read recently that you couldn't finish? I have two so far this year. Dreamland Social Club by Tara Altebrando & Eona by Allison Goodman. I got to page 40 or so of Ms. Altebrando's novel but was bored and couldn't continue. I tried reading the first few pages of Eona but there were so many fantasy aspects to the world that I didn't know so I didn't want to continue reading something I wouldn't understand... at least not without reading the first book, Eon. That's interesting to hear that about Eona, because all I've ever seen was good reviews for it. I actually appreciate your honesty and it's good to know there's at least one person out there who's impartial enough to say they didn't really like it. 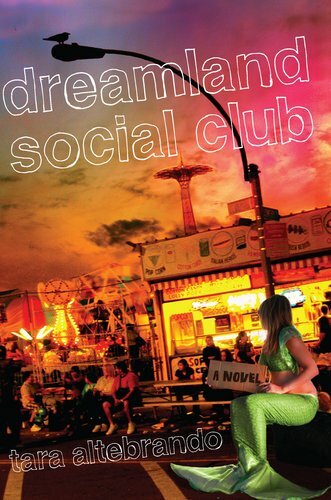 Though, I've seen a mixed bag about Dreamland Social Club, that's still one that I would like to read though. My Follow Friday + Blog Hop! Hello! -waves- I'm a new follower of yours :) Found you on Follow Friday! New FF follower. I always want to finish a book, but sometimes it's just sooo very hard. Happy Friday! Hey, new follower here. I haven't heard of Dreamland Social club, but the cover does look interesting, it's a shame that the book isn't. Hope you have a great weekend. Dreamland Social Club looks like a trip. A serious drug induced trip. Which may or may not be a good thing. I see what you are saying about Eona. I tried reading the first book of the series and I couldn't get into it. I'm like you. I don't finish a book that is painful to read. I don't understand prolonged reading torture. There are better books just waiting to be read. The only book I heard of in your list was Eona. I borrowed the Eon from the library but never read it and then returned it. I will have to take it out again when I get more time. There have been books that I have no even finished reading because I couldn't take it any longer and books that I just skipped to the end. Hi, new follower! I haven't read any of those books yet, but now I'm not sure if I should... Check out my Follow Friday post on my blog! Hi! I'm Izzy, and I'm just stopping by on the follow train. I haven't read Dreamland Social Club but it's on my to-read list, so now I'm a bit nervous, haha. Most of the reviews I've seen for it have been pretty mixed, though. I didnt care for Beloved either and someone else listed the Heart of Darkness. have a wonderful weekend. Hopping through. Too bad you didn't like Eona. I've really been wanting to read Eon and Eona.